Last year, Apple added Facebook integration to iOS, and in 2011, the company struck a deal to integrate Twitter. Both Flickr and Vimeo will now also be integrated deeply into the new operating system, so users will be able to sign into the respective networks via iOS 7’s built-in Settings application. Like with iOS’s Facebook and Twitter ties, Apple customers will be able to log-in one time into each social network and have full sharing access. With Flickr integration, iPhone, iPad, and iPod touch customers will have the ability to share photos stored and/or taken on their devices to Flickr with a single tap from the system-wide share menu. Flickr has been integrated into the paid iPhoto iOS App Store app and OS X Mountain Lion since 2012, but iOS 7 will represent the first time in which the photo sharing service has been integrated deeply into the entire iOS operating system. It is likely, that just like with Facebook and Twitter, the new iOS integration for Flickr will allow for instant log-in to Flickr via various App Store apps. For example, the Instagram application currently offers users the ability to share Instagram photos to Flickr. 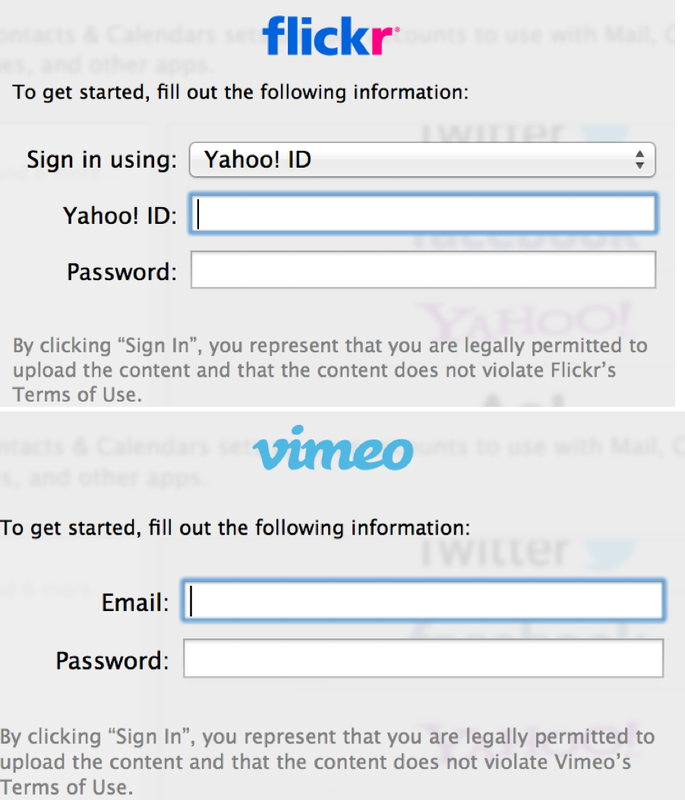 However, users currently must login manually to Flickr. The iOS 7 changes could avoid users needing to sign in for each individual Flickr-connected app. Flickr is a photo sharing service owned by Yahoo. The product was given significant changes earlier this week by the direction of recently appointed Yahoo CEO Marissa Mayer. Earlier this year, Mayer met with Apple executives to discuss increased Yahoo integration with iOS, according to recent reports, but Flickr was not one of the previously reported pieces of the discussions. Yahoo currently provides data for Apple’s bundled Weather and Stocks applications on iOS. Additionally, the company provides information for various functions within the iOS Siri voice-control software. Vimeo is a significant addition to iOS in light of Apple’s recent strategy of removing Google services from its products. Last year, Apple removed its in-house YouTube video viewing app from iOS, but the company has still allowed users to quickly upload video to the Google-owned video sharing service. Vimeo will be a new video-sharing option that Apple deeply embeds into iOS, giving users an option beyond YouTube. Sources did not comment regarding Vimeo potentially fully replacing YouTube video uploading in a future version of the iOS software. Vimeo was integrated into the Mac operating system last year with Mountain Lion. Besides being significant for Apple’s own iOS customers, it is likely that integration into iOS will be vital for the continued growth of both Flickr and Vimeo. In the months following the embedding of Twitter functionality into iOS 5, Twitter shared that the integration boosted the social network’s overall signups by 25% per-month on a global scale. With Flickr and Vimeo fighting larger and more known networks like Facebook and YouTube, respectively, iOS integration could be the spark needed to make the photo and video sharing sites household names.